MARCH 30, 2018 -- Over the last several months, OR&R’s ERMA® (Environmental Response Management Application) and ResponseLink developers have been working to integrate the flow of data between the two systems when a new spill incident occurs. ERMA will now be available in ResponseLink to integrate the flow of data between the two systems when a new spill incident occurs. Image credit: NOAA. The Response Link website (password protected) is an internal website developed by OR&R that is used to share information during oil spill or other pollution response operations within NOAA and federal, state and local partners. 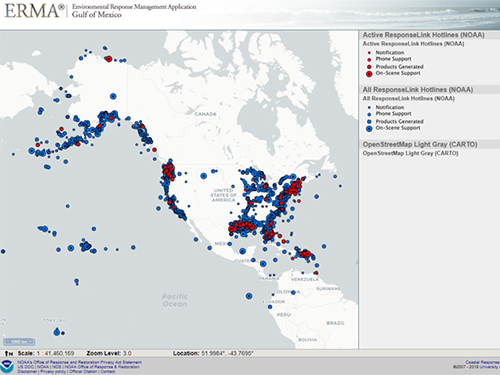 ERMA is an online mapping tool also developed by OR&R, which often serves as a Common Operational Picture, providing environmental resource managers including spill response and natural resource damage assessment teams with spatial data and analysis to inform decision making. This week, ResponseLink started automatically generating new incidents in ERMA as they are created. Previously, there were a series of manual steps that involved staff creating new data layers and setting up links between the two applications. Users can now go directly from ResponseLink to ERMA, and see the incident’s location mapped along with other spatial data such as environmentally sensitive areas, navigation charts, infrastructure data, and more. The new layers appear in ERMA’s table of contents with a standard naming convention, symbology, and description. The new ERMA layer also links directly back to the ResponseLink incident record. ResponseLink is also maintaining two layers in ERMA that show all historical incidents as well as all active incidents. These two layers require users to login to see them. This integration work completes a major milestone between the applications and development teams. Future work will continue to improve on streamlined workflows as well as improved data sharing. For more information, contact Jay.Coady@noaa.gov.